Known as one of the friendliest towns in Outback Queensland, Tambo is also the oldest town in the west. 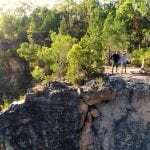 Small and sleepy, this little gem has a lot to offer travellers seeking an adventure along the Matilda Way. Make time in your itinerary to stop and explore Tambo, starting off with this list of fun facts. Tambo is where you’ll find the softies of Outback Queensland, with the famous Tambo Teddies store dialling up the town’s cuteness factor. Discover more about the cuddly creatures with these 25 reasons to love Tambo Teddies. 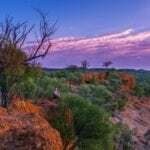 If you’re in need of some one-on-one time with your 4WD, take a visit to Tambo and head east 135km along the Wilderness Way to Salvator Rosa Carnarvon National Park. 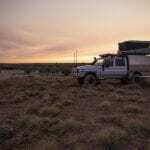 Here, 4WD tracks come a plenty, with drive routes taking you over 1200km through the rocky ranges where must-do pitstops immerse you in the sandstone wilderness and clear-water creeks. 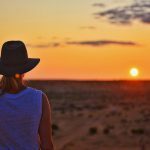 The Outback’s sunset performance needs no introduction if you’ve read this blog, however you’ll want to be on time for its daily show. We’re talking about the sky show that Tambo puts on daily at dusk, with undisrupted views of the candy-coloured hues of the sunset. 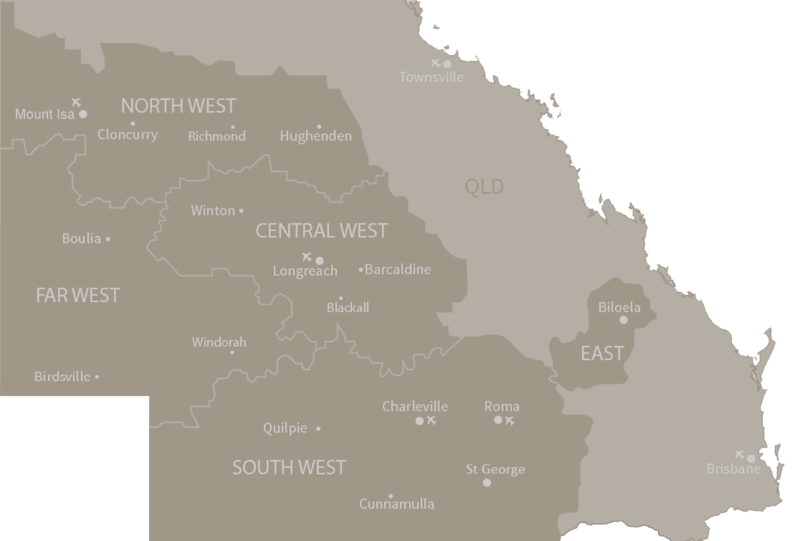 Yup – that’s right, Tambo takes the title as the oldest town in Outback Queensland – founded in 1863! Grab a brochure from the Visitor Information Centre and follow pathways around the oldest town in the west; many of the original buildings are still standing today. At the town’s heritage precinct, friendly locals are only too happy to chat and share the area’s sheep and wool industry, racing heritage and our early communications. While there, try your hand at Morse Code messaging. If you imagine Outback Queensland as a house, Tambo would be the roof, with all annual rains sliding off into the five river systems that stem from the town. Streaming down from the north, the water flows into the Burdekin, Bulloo, Fitzroy, Lake Eyre, and Murray River systems. If you’ve only got time for a coffee and cake, you’re spoilt for choice in Tambo. Make a pit stop at Cindy’s Coffee and Gifts in Tambo, where flowers and knick knacks are sprinkled throughout the café and the menu is just as sweet as the family who runs it, with the caramel coffee cake a must-order. Or you can relax on the verandah nestled amongst the landscaped gardens of Fanny Mae’s café, while munching on their special ‘Fanny Burger’, an Outback experience of its own. As you walk past the Grassland Art Gallery in Tambo, you might just mistake it for a corner store – the gallery kept the old-fashion shop front that once stood in its place. The purpose-built display space presents an ever-changing program of local, regional and touring art exhibitions. A selection of handcrafted giftware is on display, just the place to find that one-off present for the hard-to-buy-for. For a relaxing afternoon in Tambo, head to the Tambo Dam to stroll along its banks and the parklands, take a dip, have a picnic, or get out on the dam for an afternoon of water activities like canoeing and skiing. For a change of scenery, take a leisurely stroll along the banks of the mighty Barcoo; the 3km Coolibah Walk starts at the town dam and circles back into town. Learn about the local flora and take a side track to site of the only Qantas crash to ever occur, yes here in Tambo! At 5.15pm every afternoon, head on to the Outback Club at the Royal Carrangarra Hotel and place a bet on one of Ben’s champion chickens. The colourful chooks run wild at Ben’s Chicken Racing each evening, with the prize money going towards charity. You won’t go hungry here – simply stop by the local FoodWorks to stock up on fresh fruit and vegetables. Have you been to Tambo? What did you learn while you were there? We spent a wonderful four days in Tambo. Teddy bought, chicken races were fun. Food at both Cafes great. Some four wheel driving, lovely sunsets, free camping as well. Friendly people everywhere. We learnt that Tambo was worth visiting. Thanks Tambo! Does the Tambo Dam have any water in it with this drought at the moment?? Yes the Tambo Dam has plenty of water in it to enjoy. However there is no fishing here. It sure does 🙂 We have a huge downpour in March which filled the Dam overnight. Now we are looking for more rain – but there is still plenty of water in the dam and each weekend you will find locals skiing and riding donuts around the water. We were there 10 days ago. I was given a Tambo teddy 20 years ago, Grumps, from Greendale Station. Grumps accompanies us on all our camping adventures. He loved this one too returning to his makers. This visit we bought a new teddy, Toby, from Tambo Station for our daughter as she begins her camping adventures. The cousins bought her a tent for her 21st birthday recently. I was born in Tambo and would love to go back to live but my husband won’t have a bar of it .How ever I have been out a few times and I always love it my last visit was to put mum and dads ashes in with my little brothers grave and not sure how many people remembers Jack and Jean Kelly my brothers Don Colin Sister Marie are all in the cemetery there a very sad place for me I have never been able to go back even when we took the ashes back my other brothers BOB and DOUG did it all ,I have a Tambo teddy foe dad it’s called Yandarlo Jack as he worked for the Johnsons for many years then Tambo Station for some years and on one of my visits I bought two for my great grandchildren.